Welcoming, Informative and Creative, the possibilities are endless. We will ask relavant questions, we will listen attentively, offer advice and ideas. Our qualified designers will then create in-situ designs for approval before manufacture. Your signs are installed to the highest standards by our experienced, fully insured installation team. Schools Signs & Signs for Higher Education: simple individual signs to large scale re-branding projects. School Signs caters for all educational services including: all Primary and Upper Schools, Nurseries, Childrens’ Centres, Out of School Clubs, Academies, Colleges and Universities. 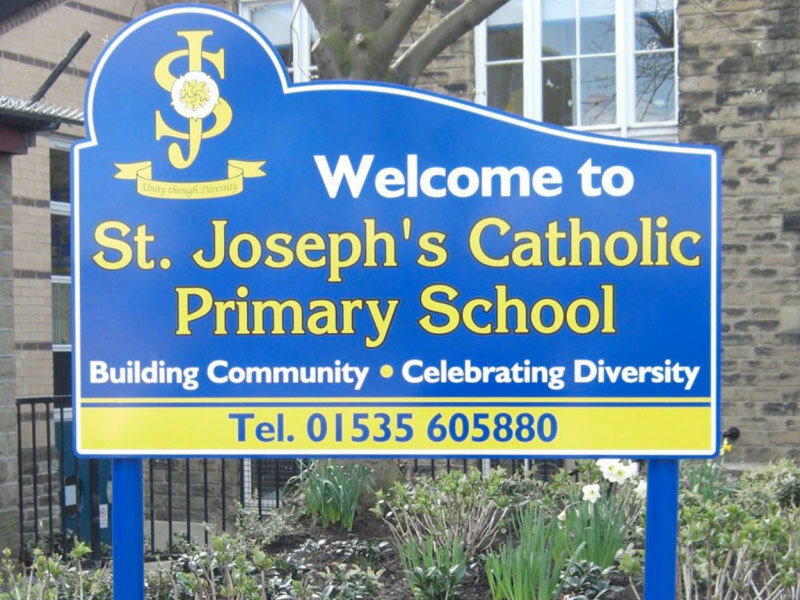 After 21 years experience of working with 1000’s of schools and other educational organisations, from the Bradford and Leeds regions, plus schools throughout the UK, we know that creative eye-catching signs play a vital role in promoting your school’s image and identity. Our mission is to design impressive and eye-catching school signs which will be both welcoming and informative to all pupils, staff and visitors. Our school signs incorporate the all important safeguarding issues, which are a major concern and priority to all schools and educational sectors these days. We have recently introduced some vibrantly coloured child-friendly designs to our range which are proving very popular with Primary Schools, Nurseries, Special Schools, Children’s Centres and After School Clubs. These stunning designs incorporate both the multicultural and disability aspect of your schools, proving that every child matters! The size of the text panels and the colours of the signs can be adapted to give you a totally unique personalised sign, unlike any other. When you contact us we will ask relevant questions, listen attentively, offer advice and ideas and if necessary arrange a site survey to assess your exact requirements, which then allows us to turn your ideas and wishes into reality in 4 very easy steps. When it comes to signs for schools we are the experts. * Local installations, subject to order confirmation.